If you use a CPAP Mask for sleep apnea, finding the right pillow to help you sleep comfortably through out the night can be difficult and costly! The Psyche Sleep Apnea Pillow couldn't be more comfortable and affordable. 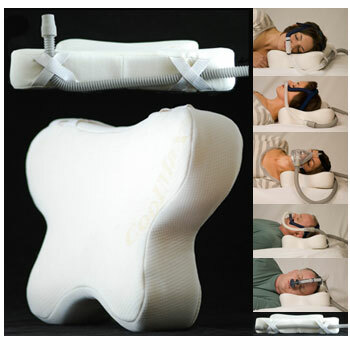 Ergonomically designed by a CPAP patient to accommodate any CPAP mask, this unique pillow is just what you need to ensure a good night sleep. The pillow's shape is similar to that of a butterfly, measuring 19" wide on one end and 13.5" wide on the other end x 11.5" long. The height of the pillow varies, measuring 3" high on the curved edges and a little over 2.5" high in the middle. This area of the pillow offers just the right amount of support for your neck and shoulders. The other end of the pillow is 4" high with sewn-in straps on each end to secure the CPAP mask's tubing while you sleep. The pillow's Memory Foam is protected with a removable quilted Cool-Max cover made from a special wicking material. This special material helps regulate your body’s temperature, keeping you dry and cool on warm nights, and warm and cozy on cool nights. Extra quilted Cool-Max covers are available and sold separately. To ensure long lasting quality, hand washing the removable cover is recommended. 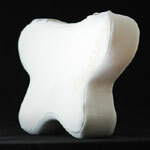 Order your Psyche Sleep Apnea Pillow today and sleep comfortably tonight! Please note: For your protection, all of our hygiene products are non-returnable!